The children would arrive at the emergency room in the University of Chicago Medicine Comer Children's Hospital with burns, broken bones, or worse. Many would be discharged after treatment only to return with another injury, sometimes too late for doctors to save them. 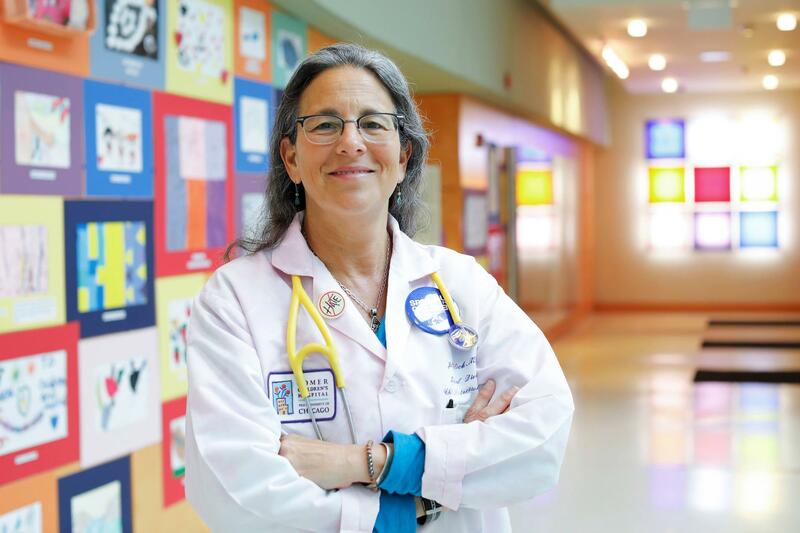 Dr. Jill Glick was a pediatric resident during the late 1980s, when she first witnessed this procession of preventable deaths from child abuse and neglect. Glick says she liked the fast-paced environment of the emergency room, which challenged her to make quick diagnoses. But one simple question tested the limits of her medical training, and her attempt to answer it led her to become one of the nation's leading pediatricians specializing in child abuse. Dr. Jill Glick established the Child Protective Services (CPS) team at Comer Children’s Hospital. A child may have rolled off the bed and broken his leg. Or his caretaker could have abused him. A basic medical exam usually couldn't tell the difference. So in 1991 Glick established the Child Protective Services (CPS) team at Comer Children’s, bringing together doctors, police officers and officials from the Illinois Department of Children and Family Services (DCFS) to hold back the rise in child maltreatment cases that hospitals like Comer Children's had been handling. Glick learned police didn't have any medically trained professionals working with DCFS to collect evidence and interview family members. At the same time, police officers didn't have the medical knowledge necessary to tell the difference between an accident and a likely case of abuse or neglect. As Glick's Multidisciplinary Pediatric Education and Evaluation Consortium (MPEEC) later discovered, it's critical to get it right the first time. Repeat injuries occur in up to 30 to 40 percent of victims when initial signs of abuse are overlooked. For others, the injuries are so severe they lead to death. That issue came into focus for Glick during the late 1990s, when she met Chicago-area mother Laurie Manzardo. On Sept. 30, 1998, Manzardo dropped off her 15-month-old daughter, Gabriella, at Happy Home Daycare, as she had nearly every workday for the past year. The child ended up in the hospital that afternoon with a 5-inch skull fracture and brain injuries consistent with a fall from a third-story window. She died a few days later. Doctors who examined Gabriella offered conflicting opinions, suggesting she could have been injured before being left with a caretaker, who was later acquitted of murder charges. Medical testimony played a major role in the legal decision. "There is no dispute that the child died from a traumatic injury," DuPage County Circuit Court Judge Robert Anderson said at the time. "The critical issue is timing of the injury. There is no direct evidence of what happened, and the state's case is circumstantial. … I have my opinion as to what happened, but the state has failed to meet its burden of proof beyond a reasonable doubt, and I have to do what the law requires." After her daughter’s death, Manzardo decided to champion Glick's push for an interdisciplinary effort to develop a state model for the response to suspected child abuse. Their system brought together police, child welfare agents and child maltreatment medical experts. With the help of Illinois Rep. Lee Daniels, they eventually formed MPEEC. Eventually, Glick says, professionals in the field recognized the need to integrate medical expertise in child abuse with the evaluations of children who are reported to the state's Department of Child and Family Services. Sometimes the system at Comer Children’s works smoothly. Glick recalls an investigation of a 10-month-old child who arrived at the hospital with a broken ankle. His specific injury appeared to be a classic metaphyseal lesion—an injury Glick says is often, but not always, inflicted instead of accidental. The parents said the child fell, but Glick couldn't be sure. So she called the child welfare hotline. Police and DCFS responded almost immediately. Because of the quick response time, they were able to gather evidence, interview the victim's family and ultimately determine that the child had likely fallen, as his caretakers said. He hasn't returned to the hospital since. Cases with a quick response like that are rare, Glick says. Outside of her Chicago program, most investigations are still characterized by slow responses and little dialogue between police and child welfare investigators. By the time they conduct the investigation, it's difficult to determine how a child was injured. DCFS case workers are overloaded, the agency is embattled with scandals and across the country efforts like Glick's are consistently underfunded. Wearing her characteristic tie-dyed scrubs, Glick points to a plastic jar in her office labeled “[Child Protective Services] fund.” It's about half full with dollar bills and pocket change. Insurance companies reimburse just 10 percent of billable services, which Glick says make up less than 10 percent of what she and her associated subspecialists and social workers do. DCFS does provide a subsidy to the three Chicago hospitals that have committed resources to medically directed child protection teams. But there is progress. Comer Children’s is one of a small-but-growing number of hospitals with a medical team dedicated to child abuse cases. Florida has pioneered a statewide system similar to Glick's, aiming to improve communication between children's hospitals, law enforcement and child protection agencies. With a unanimous vote last year, Illinois legislators mandated the state's Children’s Justice Task Force develop a multidisciplinary team model to respond to child abuse across the state. That model is more efficient, Glick says, which could save money for prevention efforts, instead of just reactionary care. Meanwhile in the U.S. at least four children die each day from child maltreatment, according to nationally collected statistics. The United States has one of the worst records among industrialized nations. Improving those numbers means reuniting more children with healthy families, Glick says, and rescuing others from preventable deaths.